In early America, great swells of rebellion from innovation and error formed into a mighty movement back to the Bible. In New England, Abner Jones and Elias Smith rebelled from the Baptists; in Virginia James O'Kelley turned away from the Methodists; in Kentucky Barton W. Stone forsook the Presbyterians; in Pennsylvania the Campbells first rejected the Presbyterians and then the Baptists. The spirit of these men and of that old "back-to-the-Bible" movement was exemplified in the work of Walter Scott on the Ohio Western Reserve. Here the ancient gospel spread like wind fanned fires across dry fields. A large segment of the people and congregations, which have as their heritage this old restoration movement, have long lost the spirit and thrust of the cause. Even among those who are now counted as churches of Christ there is an enormous loss of restoration spirit and soundness. Yet, today there are new waves of restoration forces pressing the battle in respect of those early American restoration principles which harmonize with that book we call the New Testament. From the extremities of the length and breadth of this country, and all between, come highly encouraging reports of activity in a great and growing swing to the conservative principles you read about in the Bible. As I write these lines I am in "The Land of Eden," famous 20,000-acre colonial estate of William Byrd, Virginia planter, author, and surveyor of the Virginia-North Carolina line. Here the Ridgeway Road congregation which swung away from Christian Church alliances a decade ago, now rejects similar innovations seen among some churches of Christ. Recently, I conducted a meeting in the Rio Grande Valley of Texas where most of the Spanish speaking churches are on the right and conservative side of current issues and where several English-speaking preachers and churches are waging an effective campaign. Before this, I was in a meeting on the Western Reserve of Ohio where can be found many sound, solid and active churches holding the lines against innovations. Recent experiences in the Little Dixie area of Oklahoma and along the Ohio River in Western Kentucky give me reason for encouragement and optimism. These are current reports from limited areas--but these reports are indicative of what is going on in the whole country. The cause is prospering! What cause? The original restoration cause--not really "The New Restoration"-- it is the old one still going on! While many congregations have stalled or stopped, bogging down under the load of institutional pressures, sponsoring church encroachments, and secular innovations, many others continue free from such hindrances to soundness. 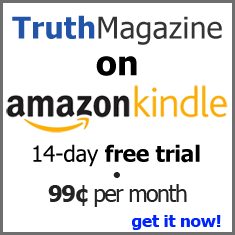 TRUTH MAGAZINE has been a formidable foe to those who hinder the rebuilding of the walls of Jerusalem. TRUTH MAGAZINE has fought well, and has succeeded greatly Bryan Vinson, Jr. and all those who have worked closely with him have performed efficiently and accomplished much good. They are to be commended by us; they are blessed by the Lord. It is with great pleasure that I join with Cecil Willis in taking over the responsibilities of publishing this paper. I do not know anyone I had rather work with in this kind of endeavor. I'll feel secure in this effort, working with him. It is with much appreciation for Bryan Vinson, Jr. that I began work on TRUTH MAGAZINE -- appreciation for his confidence in Cecil and me; for his good work; his soundness. We'll be looking for the continual support of all those who write for TRUTH; who help it financially; who assist in many other ways. Without you we cannot keep the paper going. With your help we shall not cease.